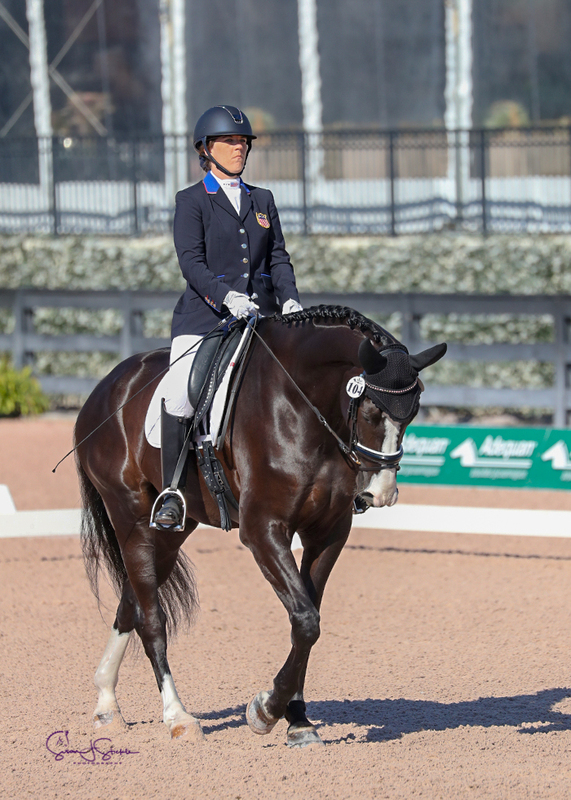 Wellington, FL – January 19, 2019 – Week 2 of the Adequan® Global Dressage Festival (AGDF) features CPEDI 1*/2*/3* Para Dressage, presented by Adequan®, Mission Control, Nutrena, and Fair Sky Farm. 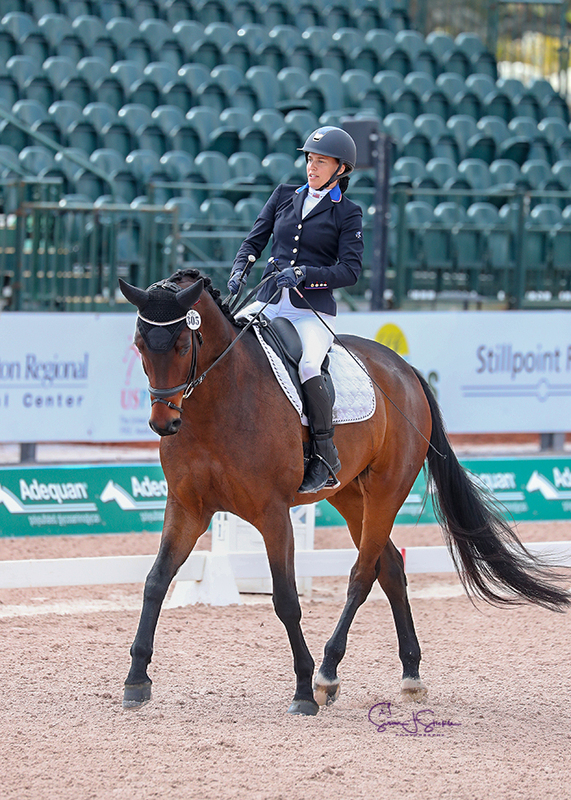 Competition continued on Saturday, January 19, with a win for Alanna Flax-Clark (USA) and her horse El Paso in the FEI Para Individual Test Grade II – CPEDI 3*. 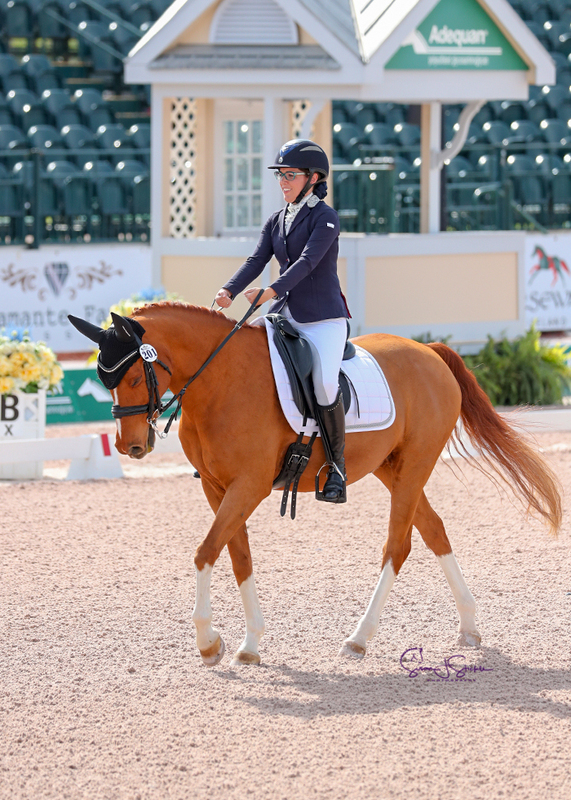 Week 2 of AGDF will conclude on Sunday with CPEDI 3* Freestyle competition. Flax-Clark and El Paso, a 15-year-old Dutch Riding Pony gelding by Elegant, earned a score of 65.735% in the Grade II Test. Grade II is for riders who mainly use wheelchairs and have some combination of trunk, arm, or leg impairments. Flax-Clark is from Granada Hills, CA, and now trains in Califon, NJ, with Sarah Schmitt. “He’s super sweet and when we go in the show ring he’s really, really focused,” said Flax-Clark of her partner of one year, El Paso. “He’s actually a hot horse, and it helps me conserve my energy when I’m out there. He’s just really loving and focused in the show ring, which is really nice for me and it helps me stay focused in the show ring and not have to worry about anything around me. It’s like we’re in our own little bubble and can really focus on our test. 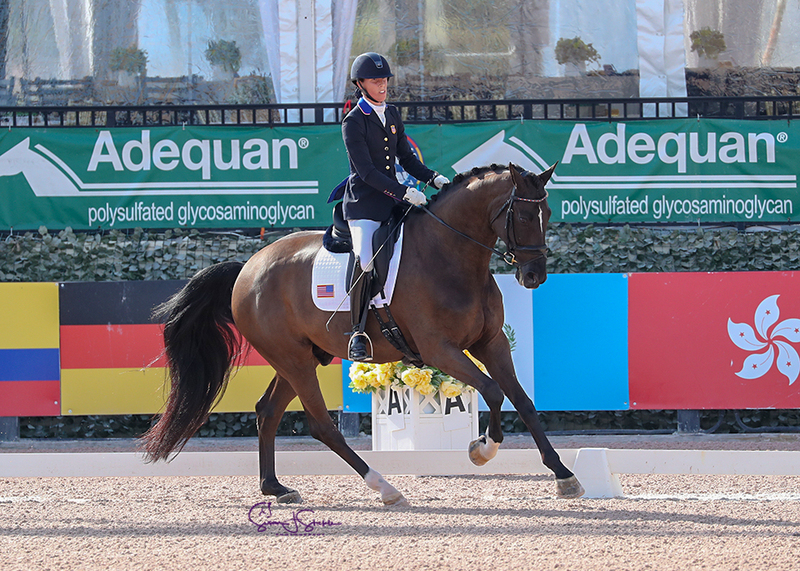 Roxanne Trunnell (USA) started the day with a win in the FEI Para Individual Champ Test Grade I – CPEDI 3* with a score of 73.155%. Trunnell rode Dolton, a seven-year-old Hanoverian gelding by Danone I and owned by Kate Shoemaker. Fellow USA rider Rebecca Hart and El Corona Texel won the FEI Para Individual Champ Test Grade III – CPEDI 3* with a score of 69.088%. Hart rode El Corona Texel, a 10-year-old KWPN gelding by Wynton and owned by Rowan O’Riley. 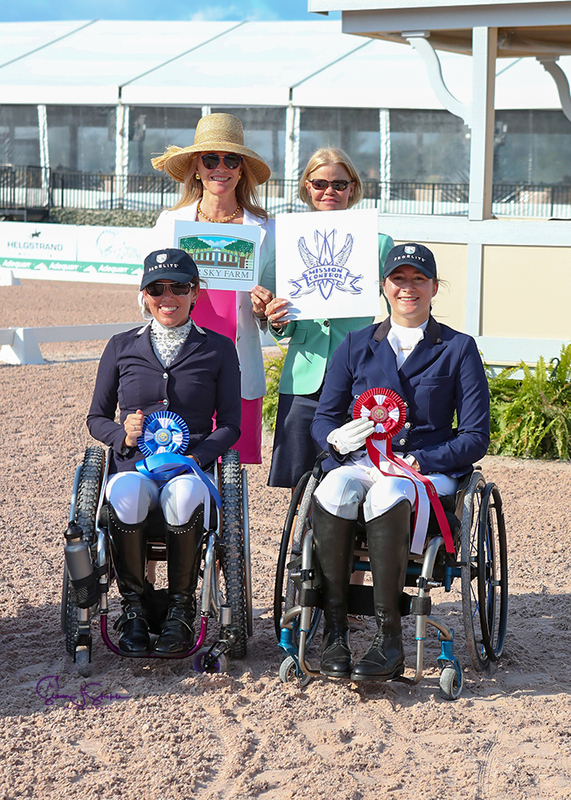 Kate Shoemaker (USA) concluded the day with a win in the FEI Para Individual Champ Test Grade IV – CPEDI 3* with a personal best score of 73.252%. Shoemaker rode her horse Solitaer 40, a 12-year-old Hanoverian gelding by Sandro Hit. Week 2 of AGDF will conclude on Sunday, January 20, with FEI Para Freestyle CPEDI 3* tests. For more information and to see a full list of results, please visit www.globaldressagefestival.com. 1.Alanna Flax-Clark, USA, El Paso, 15-year-old Dutch Riding gelding by Elegant and owned by Alanna Flax-Clark: 66.471%, 65.294%, 65.441%, 65.735%. 2.Beatrice De Lavalette, USA, Delegada X, 17-year-old PRE mare owned by Beatrice De Lavalette: 61.176%, 63.676%, 64.706%, 63.186%.